(CNN) -- Acts of kindness will help pull the nation through its economic crisis, according to the woman who came to the rescue of a homeless Floridian who publicly appealed to President Obama. 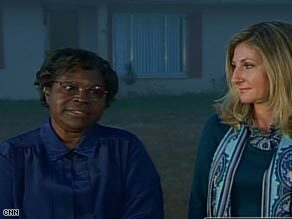 Henrietta Hughes, left, and Chene Thompson talk on the lawn of the home Thompson is letting Hughes use. Chene Thompson, the wife of state Rep. Nicholas Thompson, R-Fort Myers, is letting Henrietta Hughes and her son stay in a house she owns in nearby La Belle rent free until they get back on their feet. "You don't have to be a politician to put forth a stimulus package," Chene Thompson said during a joint interview with Hughes Thursday on CNN's "American Morning." "This is our own little mini-stimulus package for a person who was a stranger and now is a friend. "Anybody can help anybody at any time. It doesn't need to be something that comes from Washington; it can come from your own home and from your heart, even if it's for a little bit." Thompson, who was in the audience, stepped forward afterward to offer Hughes her vacant house, which the Thompsons had to leave because it is outside her husband's legislative district. "She was sincere and direct and to the point, and she needed help," Thompson said. "And it actually touched me and I started to tear up and I started to cry. ... It sort of broke my heart." Hughes feels "overwhelming gratitude," she told CNN in the front yard of the house, "because no one would do that." "Oh, yes they would! Yes they would!" Thompson interjected, wrapping an arm around Hughes' shoulders. "I was just in the right place at the right time." Both women beamed. The house has remained unsold in southwest Florida's depressed market, Thompson said. She continues to be responsible for paying the mortgage, property taxes, insurance and utilities, so it benefits her to have someone occupying it to keep it from becoming run-down, she said. According to the White House, the Fort Myers-Cape Coral area had the highest foreclosure rate in the nation last year, with 12 percent of housing units receiving a foreclosure-related notice. Median housing prices in the Fort Myers metropolitan area have plummeted from $322,000 in December 2005 to less than $107,000 in December 2008, the Obama administration said. Nearly 12,000 jobs have been lost in Fort Myers in the past year. White House spokesman Joshua Earnest said Wednesday that the administration connected Hughes with local housing officials in the crowd. On Wednesday, the head of the local housing authority, Marcus Goodson, said he met with Hughes and is working on finding her a subsidized housing unit with a short waiting time. Hughes on Thursday urged Congress to approve legislation to deal with the housing crisis. "If that would pass, that would help many other -- hundreds and thousands of -- low-income persons to receive housing," she said. CNN's Ed Hornick and Mary Snow contributed to this report.